Official character Twitter accounts also back in motion. The German USK has rated Resonance of Fate for PlayStation 4 and PC. Both ratings are listed as published by tri-Ace, the developer. 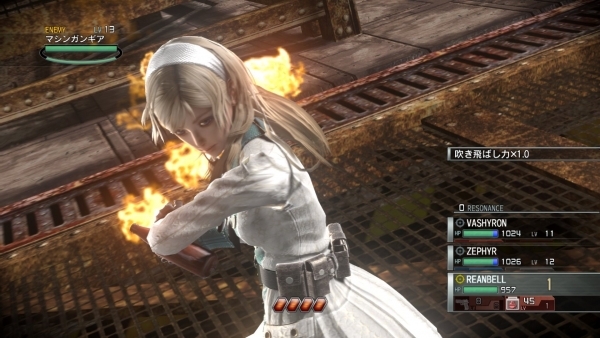 The original release of Resonance of Fate was published by Sega for PlayStation 3 and Xbox 360 in 2010. The official character Twitter accounts used for promotional purposes in 2010—@Reanbell, @Zephyr_eoe, and @Vashyron—have also begun tweeting again. tri-Ace will announce a new title at Tokyo Game Show 2018 on September 20. Perhaps it is this leaked Resonance of Fate remaster? Battle in fantastic cinematic action as your characters wield firearms in a semi-real time gameplay system. Pull spectacular moves and precision attacks through this special mode designed to chain enemy attacks together. This unique story is built around a gigantic clock tower like machine delving deep into fate and the machinery that controls it. Masterfully crafted environments illustrate the deep tapestry of this dystopian world. Customize your characters and give them a unique look within the game and cutscenes. Extensive weapon customization allows your character to have specialized weapons from parts unlocked or bought throughout the game. Customize and change the look of your character by unlocking costumes along the way. Civilization on earth has long been forgotten with the previously lush world now a burned out remnant of its former self. Originally built as an experimental life support system, Basel is now the only place on Earth where mankind can sustain their lives. As their role their PMF (Private Military Firm) the group (Vashyron, Zephyr and Leanne) must seek out and complete quests for their clients leading them on a journey that will reveal the truth of Basel. Battle system: Battle in fantastic cinematic action as your characters wield firearms in a Semi-real time gameplay system. Invincible mode: Pull spectacular moves and precision attacks through this special mode designed to chain enemy attacks together. Unique story: Built around a gigantic clock tower like machine, the story will delve deep into fate and the machinery that controls it. Beautiful environments: Masterfully crafted environments pepper this title to illustrate the deep tapestry of this dystopian world. Customization: Customize your characters and give them a unique look within the game and cutscenes.